Remember the days of mix tapes? I do. These tapes were the cherished soundtracks of our lives. I'm sure most of you have made or received a couple in your life. If they were dance music, hip-hop or anything with drum machines, you probably wished you could mix them together like a real DJ mix. Now you can do this with MixMeister. Effects for your Decks ? Who will be the next Tiesto ? I have been a DJ for 13 years, and believe me, I was a little wary when I first heard about MixMeister. I have tried more expensive DJ software aplications and none of them were really that great at determining and matching the correct BPMs of tracks. I haven't yet found software that can match a really good DJ. My doubts subsided a bit when I first watched the demo for MixMeister. I was nothing short of amazed. Even when the best DJs make live tapes it seems there's always one or two off mixes that will remind you that no DJ is perfect. I could see how MixMeister could be a bit threatening to us "analogue" DJs. The first thing I noticed about MixMeister was that it started up pretty slowly. The system I tested it on is an IBM ThinkPad laptop with a 1.8GHZ Pentium Centrino processor and 2GB ram running Windows XP Professional. The cool thing is it starts with a prompt to watch some videos that could set you off in the right direction in getting to know the software. It takes a bit of prep work at first: you'll probably want to go out to dinner after you load your library into MixMeister as It takes quite a while to do the math and calculate the key and BPM of each of your songs. It took about four hours to analyze my library. I do have a lot of tracks on my hard drive so this is probably why. When it finally does finish calculating your library, you notice that next to the title and artist you also have the BPM and key. Mixing in key is the new trend in DJing so it is great to be able to sort your tracks by key. I have always had trouble figuring out the key of my tracks but this makes it super-easy. To get started with MixMeister, you grab an MP3 from the library and drop it on the playlist editor, which really resembles a standard sequencer. I think it is a pretty smart way to lay out tracks for DJing. It automatically puts the next track you drop from the playlist near the end of the previous song. It is accurate in matching the BPMs of your tracks but it's not very good at figuring out the best phrase to start and end the mix. Phrasing is an aspect of beat mixing, not a separate technique. Because most electronic dance music tracks have a 4/4 time signature and a simple structure of 16-bar phrases, to align the phrases of two tracks it is often enough to start the track to be mixed in at a phrase boundary in the track currently playing. Careful phrasing can make the mix seamless, by making the breaks in two tracks coincide, or aligning the break in one track with the start of the beat in the other. MixMeister's choices of intro and outro phrase anchors are good enough for a decent mix. I don't think many people would notice if the mix beginning and end are not in the ideal place in a 16 or 32-bar phrase, but being a seasoned DJ I can definitely notice it. Fixing this problem is easy enough. I guess you can't expect it to do everything for you. When you find the ideal place to start your mix, you just drag the start marker to the peak of the chosen waveform. It automatically snaps to the peak of the wave so it's just a matter of just choosing the right point in the song to start the next one. It took me about an hour and a half to figure this program out enough to make a decent mix with it. I first laid all the tracks out and then I skipped to the transitions and tweaked the mix so it sounded pretty live. The most amazing thing was when I dropped a track from my library that turned out to be a heavy metal song and it mixed great with a techno track. (I really have no idea how a heavy metal track got into my library). This little "accident" really convinced me of the accuracy of the beat-matching algorithm in MixMeister. Mixing with the mouse is fine, but if you have a MIDI controller, it is a lot more fun. It just feels more natural doing long transitions and EQ-ing with a controller. It takes seconds to map out your MIDI controller in MixMeister but it's pretty easy. MixMeister comes with a lot of presets and will automatically map different MIDI controllers, my Behringer BCF2000 being one of them. I tried the default mapping for my controller, but personally, I like the way I mapped mine better than the default preset. I mapped my controller to control the levels of two track channels as well as the EQ (bass/mid/high) on each channel. I'm a little bit minimalist and a little bit traditional, so it didn't take much time mapping my controller to just act like two turntables and a mixer. If you really want to get crazy you can mix up to 8 songs simultaneously at any given time. MixMeister also has hardware called MixMeister Control that includes a Numark USB controller that is made especially for MixMeister. It is a cool controller as all the parameters for MixMeister are laid out the same way as in the software You can also use the controller with other audio software as a standard MIDI controller. Another great thing about MixMeister is you can use your VSTs in the mix and assign your MIDI controller to control your chosen parameters of the VSTs in the effects window. MixMeister ships with Camel Space, and one of my favorite plug-ins: Isotope Ozone. Ozone includes all the tools you need to master your sound very easily. Ozone comes with some awesome presets so you really don't have to know anything about mastering to make your mix sound better. There are also some basic DJ effects included with MixMeister, like delays, reverbs, flanges, etc. You can map any of the effect parameters to your controller by using the learn button that sits in the window next to the effects. You can control the parameters of your VST within the program or by opening the VST in its own window. 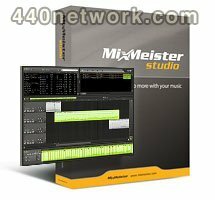 MixMeister will record all the automation of the effects as you tweak them. I really liked the built-in effects because of their simplicity. They also feature a straightforward wet/dry parameter like most DJ mixers have. One of the major problems I found with using MixMeister was that the audio quality of your MP3s seems to be degraded somewhat by the software. It seemed like my MP3s just didn't sound as good as they normally do. I know this can happen when there are extreme jumps in BPMs as the program has to resample to compensate for the difference, but these were mostly tracks around 125 to 128 BPM. (Is this why it came with Ozone?) It also is pretty CPU-intensive, especially in the transitions. I believe this drawback will keep it out of the professional spectrum of DJ software. I am still a vinyl-junkie for almost entirely this reason. MixMeister also lacks the ability to draw in different envelopes on the track sequencer. It is easier to rewind the transport and re-"draw" the envelope again using the controls than to go back and edit them after the fact. I could see people using MixMeister live as well as making mixes. It would be fun to just load a previously saved mix made in Mixmeister and just tweak the effects and EQ when you're playing live. The DJ can now socialize AND rock the party. It would be cool software to play with on the plane or on long trips in the car. I think it would also be great for producers who want to sample and mix their own tracks as well. The looping feature is very accurate and you can enter how many times you want your loop to loop. MixMeister would also be ideal for fitness instructors, cheerleading coaches and dancers who need to make custom mixes for routines. It is very easy to export your mix to any type of audio file format or you can burn a CD directly from the MixMeister software. I will definitely spend more time figuring this program out and I believe it will be useful to anyone who's ever wanted to make a decent mix but may not be an experienced DJ. The price is very reasonable considering the quality plug-ins that are included. It seems like everyone wants to be a DJ these days and now anyone can with MixMeister.